‘One African country that seems unable to put a foot wrong at the moment is Tanzania’ according to the March issue of ‘African Business’. IMF Director for Africa Goodall Gondwe spoke of Tanzania’s improving economy as a ‘tremendous achievement’. 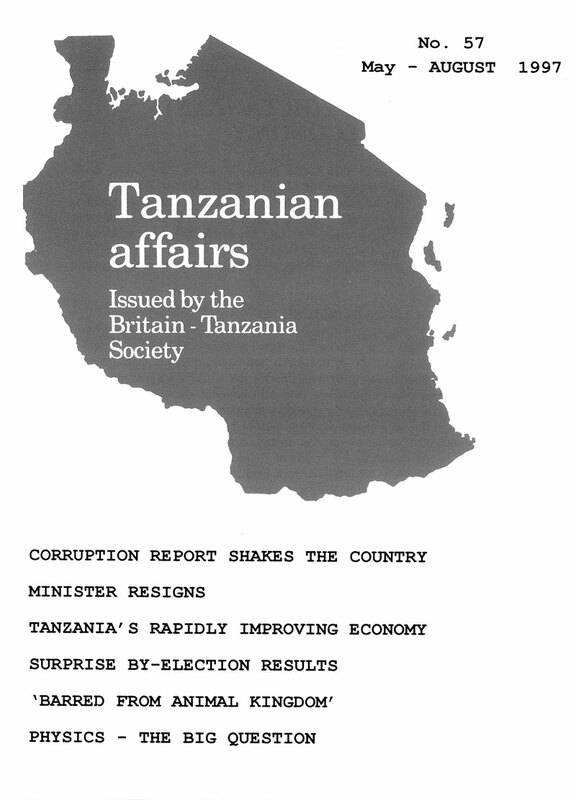 ‘Africa Confidential’ headed its most recent article on Tanzania: ‘Baby Tiger – At Last Some Good Economic News to Bolster President Mkapa’s Multi-party Democracy’ as some people even began to say that Tanzania could develop, in the new millennium, into one of the first ‘tiger economies’ in Africa. It was announced on January 23 that Tanzania had received a seal of approval from the Paris Club of donors. It had been given the most generous terms of debt reduction currently available for the world’s poorest nations – a debt relief programme of $1 billion (Shs 600 billion). The total debt is $7.8 billion. This relief should bring the government’s debt repayment to the 12 Club members in the financial year 1996/97 to Shs 44 billion instead of the Shs 100 billion anticipated. The remaining Shs 56 billion ($700 million) will be either rescheduled or refinanced over a period of 23 years including a six-year grace period on debt payment. In addition each creditor country can – separately – convert some Tanzanian debt into development projects. The creditor nations said that Tanzania’s very low per capita income and its very severe debt burden justified an exceptional treatment of the debt. The debt relief followed President Mkapa’s agreement to split the National Bank of Commerce into three parts. World Bank Resident Representative Ron Brigish said the debt relief was a major pat on the back for the government of President Mwinyi and its tough economic policies. “Tanzania is now back in the fold” he said. Tanzania’s GDP growth rate reached 4.5% in the first half of 1996/97 and Tanzania’s foreign reserves have reached a record $450 million, the highest in the country’s history, following strong export growth and new donor support. Inflation has dropped at a record rate from 27% a year ago to 13.8% in February this year, the lowest figure for 11 years. Export earnings are up from $500 million on average for the last five years to $762 million last year. Revenue collection has improved substantially from Shs 29 million per month last year to Shs 45 million this year. The over-manned and underpaid civil service has been cut back from 335,000 to 275,000 since 1992 and those made redundant have received donor- financed compensation packages. Foreign investors are coming back slowly but many are waiting for the passage of the new ‘Investment Bill’ which came before parliament in April. New investors in mining have recently claimed to have found up to 410 metric tonnes of gold which could eventually put Tanzania in the same league as South Africa and Ghana as an African gold producer. The huge new project in Kilwa, now well under way, will provide Dar es Salaam (and even parts of Kenya) with electricity from natural gas within two years. Tourism is beginning a boom – receipts are up from $250 million in 1995 to $322 million in 1996 and new hotels are springing up all over the country. And between 1992 and 1996, 125 of the country’s 400 mostly dilapidated parastatal industries have been wholly or partially privatised and many are now coming back into production. For the first time in its recent history, as a result of its tight monetary and credit stance, the government is expected to be in a position to meet 60% of its expenses during the next financial year instead of relying on borrowing or from the donor community for the major part of its expenditure. The Dar es Salaam ‘Business Times’ is full of praise for what it believes to be the recommendations of the ‘Presidential Task Force on Tax Rationalisation’ which was due to present its report as this issue of TA went to press. The proposals could, if implemented, increase revenue collection from this years’ estimated Shs 564 billion to Shs 790 billion next year. ‘This would be a phenomenal improvement over a single year’ the paper wrote. Meanwhile, the second tranche ($40million) of the IMF’s Enhanced Structural Adjustment Facility (ESAF) has been released; the money is to help increase allocations in the 1996/97 budget for the very hard pressed education, health and water supply sectors of the economy. Finance Minister Daniel Yona attributed these positive trends in the economy to the radical reforms adopted in the mid-1980’s at the behest of the World Bank and the IMF. Following the agreements with the IMF, the freeze on foreign aid, which was introduced at the time of the tax exemption scandal two years ago, has now ended. Tanzania has been picked as one of the six developing countries in Africa selected for Japanese aid; a representative of the Japanese Ministry of Foreign Affairs said that Japan was impressed by Tanzania’s political and economic changes. The EC’s latest package of grant aid for Tanzania is the second largest to be given amongst all 70 member countries of the ACP. Norway has agreed to provide $50 million in development aid this year, Denmark has promised Shs 150 billion and the African Development Bank is releasing $21.5 million for the first phase of a $281 million project to ease Dar es Salaam’s chronic water shortage. But, to put matters into perspective, it has also been announced recently that about 60% of rural people and 39% of urban inhabitants have incomes below the poverty line. Here too, in spite of the continued reluctance of foreign donors to give further assistance pending a solution to the political deadlock, the economic news has been encouraging. The ‘Business Times’ reports that GDP growth was 3.9% in 1996/97 compared with 3.7% the previous year. Clove production increased to 10,105 tons last season, the best for three years but copra went down by 51%. Inflation has dropped to 12.6% compared with 30.8% the previous year. Revenue collection remained poor. Tourism has become Zanzibar’s second most important foreign exchange earner (after cloves). Tourist numbers increased from less than 30,000 in 1985 to 56,415 in 1995 and the number of hotels and guest houses had increased from 10 to 100. Tanzania has shown once again how harsh its climate can be. Following the failure of the short rains, severe drought – in some areas the worst for forty years according to the ‘East African’ – has been afflicting almost four million people in nine regions of the country and foreign donors have been asked for assistance. Dar es Salaam’s three million population has been suffering from severe water shortage because of the very low level of the Ruvu river and breakdowns in equipment. And then, with the beginning of the main rains in late March, the skies opened all over the country and there have very been very severe floods. Some 40 people are believed to have been killed and 2,100 people have been rendered homeless in Kilwa District. There has never been anything quite like it in Tanzania or even in many other countries. Few administrations in the world seem to be as willing as the Mkapa government to wash their dirty linen in so public a way. There were screaming headlines and juicy stories in the press. Some tabloid newspapers began serialising it. And some big people were mentioned including a former prime minister, a cabinet minister, six former cabinet ministers, a former chief secretary, a chief engineer and a former mayor of Dar es Salaam. • amongst journalists for ‘cheque book’ journalism – accepting bribes to write or not to write revealing stories; and so on. • the setting up of a ‘Truth Commission’ to prepare a code of ethics, to administer oaths, to take legal action against those making false declarations …. • declaration by leaders of all presents received …. • the size of the government should be reduced …… and many more. President Mkapa has announced that a team of experts is working on the feasibility of taking criminal action against those implicated in the report. If there was enough basis for action the culprits would be prosecuted. If not, disciplinary action like retirement would be instituted. The Warioba Report had its critics. Munir Daya in the ‘Sunday News’ wrote that the persons mentioned in the report had been tried, convicted and punished by the press without them being given a chance to defend themselves. Ludovic Ngatara in the Dar es Salaam ‘Guardian’ used the simile ‘Unchained dogs after long captivity’ to describe the opportunity which had been offered, when, in the late eighties, the CCM’s unpopular ‘Leadership Code’ had been abandoned and replaced by the ‘Zanzibar Declaration’. ‘The unchained party and government leaders ‘ he wrote, ‘rushed for all sorts of whatever seemed to be of some value for enriching themselves’. The article then listed examples of these things, including funds levied for the construction of the CCM headquarters, foreign exchange obtained for export crops, donor funds, bank borrowings, land reserved for wildlife. . . . .. and went on to say that, since nearly all government and party leaders had been involved in corruption, the Warioba Commission should have named those who were not corrupt. “Everyone has been doing it, Why only us?” (Thank you Simon Hardwick for bringing this latter news to my attention – Editor). A few days after the report was published, and in which he had been mentioned in connection with allegations about the issue of a hunting licence to the Deputy Minister of Defence in the United Arab Emirates, Dr. Juma Ngasongwa, Minister for Natural Resources and Tourism resigned from the government. This, he said, in his letter of resignation, was ‘to enable state organs to investigate the allegations that featured in the report’. President Mkapa replied by commending the Minister saying that by the action he had taken he had demonstrated his sense of accountability and loyalty to the CCM. At the hearing of a separate election petition in court in March however, which alleged infringement of election rules by Dr. Ngasongwa, the judge found that all the charges against the MP’s conduct of his election campaign had been ‘baseless’. On February 21 Prime Minister Frederick Sumaye directed the new Tanzania Revenue Authority to sack all its corrupt officials (“who are known to fellow workers” he said) before the end of their one-year probationary period. Instructions were also issued that by June 30, Ministers, Regional Commissioners, District Commissioners, and departmental and parastatal heads had to submit to the Prime Minister reports on the actions they intended to take to stop corruption in their respective jurisdictions in accordance with the Warioba Report. Once again Tanzania’s unpredictable electorate has surprised the nation. This was in the second and third by-elections under the multi-party system. The results of the Magu, (Mwanza Region) by-election, following the death of the late MP Mr Malaki Lupondije and the Morogoro North by-election, following the murder of Professor Nicas Mahinda MP, are given below. Some mystery surrounds the death of Professor Mahinda. The police have been quoted as saying that the MP was probably killed by a bullet from his own shotgun fired by his mason, Mr Franco William, while some 30 armed bandits were raiding the professor’s beach house in Dar es Salaam. Mr William was arrested. At first sight the Magu result looks like a purely tribal vote – Sukuma people voting for one of their own. But rural Tanzanians are accustomed to doing this. In the days of the one-party state, MP’s tended to look after their own areas and if they did this conscientiously they would be re-elected. In this case, Magu voters had the additional satisfaction of being able to vote for a local man who also held the prestigious position of National Chairman of his UDP party and had been a presidential candidate in the 1995 general election. The voters must have been bemused by the behaviour of Tanzania’s two main parties. CCM recruited as their candidate a well-known local businessman who had been the NCCR candidate for the seat during the general elections – which indicates how much more important personalities are than policies in Tanzania’s fledgling democracy. For the previously triumphant leading opposition party the NCCR-Mageuzi, still on a wave following its great victory in the Temeke by-election, the result was a disaster and a salutary lesson. The party had been strongly advised not to contest this by-election because Mr Cheyo had supported NCCR in the Temeke by-election and because of the need for the opposition parties to cooperate if they are ever to beat the CCM in the next general election. The NCCR announced that it had investigated the situation on the ground and had found that John Cheyo could not win. It then put in a massive effort in which virtually all its top leadership took part. But to no avail. The Morogoro result is better understood when it is recalled that this seat has been won by Asian candidates in the past and also by the fact that former Secretary General of the CCM party Lawrence Gama is Regional Commissioner in Morogoro and must have been able to add his weight to the CCM campaign. All Tanzania’s political parties have had headaches recently. For the CCM the loss of Magu was a severe blow but regaining Morogoro North must have raised morale. The dramatic news about the death of its former Secretary General Mr Horace Kolimba (see Obituaries) at the precise time at which he had been summoned by the party’s Central Committee to explain his public criticisms of the party’s ‘lack of vision’, created a great shock. Comments on his views had varied from an accusation that he was a traitor to the party to more moderate expressions of opinion to the effect that he was right and that the party should be more open in discussing its aims and policies. The CCM has also been embarrassed over an apparent recurrence of the kind of authoritarian action which was common in the days of the one-party state. The ‘Sunday News’ reported that on February 28, that, in spite of protests from some seven local and international journalists’ associations, Mr Adam Mwaibabile, a journalist in Songea, had been sentenced to one year in prison for ‘possessing confidential government documents’. The ‘document’ was apparently a letter from the former Regional Commissioner directing the Songea Municipal Director not to issue a business licence to the journalist, to enable him to run a stationery shop. According to the East African, the National Security Act of 1970 under which he was jailed had been criticised as long ago as 1992 by Chief Justice Nyalali as unconstitutional, oppressive and not fit to remain on the statute book. On March 14 the ‘Business Times’ reported that a squad of Dar es Salaam University dons had flown to Songea to take up the case. An appeal was subsequently launched in the High Court which decided that this was a civil case and Mr Mwaibabile was released, after one month in prison, pending further court consideration. The split in the NCCR-Mageuzi party between the intellectuals like Mr Mabere Marando (who was briefly arrested at the Morogoro by-election for holding an illegal meeting) and the leader of the party, Mr Augustine Mrema, because the former do not believe that Mrema has the educational calibre to be the party’s presidential candidate in the next general election, is coming more into the open. When they appear together in public, the very popular Mr Mrema is usually loudly applauded but Mr Marando is not. The loss of two key by-elections must have added strains to party unity. Meanwhile, the mainland and island branches of the Civic United Front (CUF) have apparently split. The mainland branch announced on January 22 that it was prepared to recognise Dr. Salmin Amour as President of Zanzibar, something which is totally unacceptable to the island branch of the Party. The previous day, fierce fighting involving knives, stones and bare hands had broken out at the Dar es Salaam meeting. The intruders were accused of being spies from the party’s top leadership in Zanzibar. The meeting was stopped by police. The sudden re-emergence of the fiery Rev. Christopher Mtikila on to the political scene has created something of a sensation. 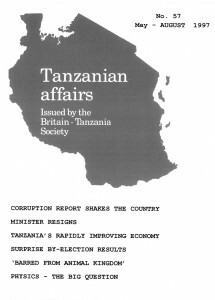 Mtikila became very popular in the past with his extreme views on many issues, his attacks on non-indigenous Tanzanians and his vigorous denunciation of the Union between the mainland and Zanzibar, but he has been keeping a low profile for a long time. He was the first prominent opponent of the government when multi-partyism was introduced in 1992. He has tried since then to have his ‘Democratic Party’ registered but, as he refuses to accept the Union, this has always been refused. On March 31 he announced that he had joined the CHADEMA party and he was then selected to fight the Ludewa by-election scheduled for May 25 as the CHADEMA candidate. As this issue of TA goes to press, he has been arrested for allegedly inciting people to act violently and making false allegations against government leaders. Mtikila’s acceptance as a member of CHADEMA may be partly explained by the absence in hospital in Nairobi of Edwin Mtei, the party’s leader, and the growing influence of more radical members. Election petitions which could lead to further by-elections are underway in Rungwe West where the advocate for the NCCR petitioner complained that the defending CCM MP had appointed two advocates; he requested the judge not to demand two lots of costs if he lost the case (laughter); in Ukonga, Dar es Salaam, where the CCM MP is alleged to have bribed voters by offering home brewed gin (gongo) to a football team; in Ilala, Dar es Salaam where the case has been making very slow progress during recent weeks; in Muleba, Bukoba where it was claimed that 13,330 registered voters did not vote because of poor control at polling stations; and at Kibaha where there was a long debate in court as to whether former CCM Secretary General Lawrence Gama could be admitted as a witness – eventually he was. Organisation of African Unity (OAU) Secretary General Dr Salim Ahmed Salim, who said that his father was from Pemba and his mother from Unguja, appealed for political tolerance in the isles during a visit to Tanzania in January. party politics should not be allowed to divide the people, he said. If the simmering political crisis was left unchecked it would jeopardise the unity of Zanzibaris and ultimately of Tanzania too. But as this issue of TA goes to press there is no sign of any resolution of the problem. The Aga Khan and President Amour have inaugurated the Stone Town Cultural Centre housed in the ‘Old Dispensary’. President Mkapa has opened a new 51- room luxury Serena Hotel which has been converted from the colonial style Old Extelcoms Building and the Chinese Doctors Residence which once housed David Livingstone and later the British Consul – East African. President Amour announced on March I that the Isles’ government will in future have a fourth element in its security system. Vigilantes are to be given training, uniforms and special allowances to motivate them. The other security units are the Jeshi la Kujenga Uchumi (JKU), prison staff and coastal security guards (KMKM) – Sunday News. Licenses have been issued to 43 journalists to allow them to work in Zanzibar. Those who have not yet applied for licenses, which cost Shs 6,000, risk being fined Shs500,000 or put in prison for up to five years – Daily News. A seaweed company in Pemba is offering free trips to Mecca for people able to sell more than 13.5 tons of seaweed to the company within six months. Zanzibar seaweed sales in 1994 totaled Shs 492 million – 27% of the Zanzibar GDP – Business Times. Although it created temporary chaos all round the country the government stuck to its guns and insisted that from March 1 every bus authorised to carry passengers must have a speed governor fitted to limit speed to 60km/hour. Garages worked overtime as bus owners left the fitting of the governors to beyond the final date. • Since daladala buses were not operating Star reporter Mike Lukumbo decided to cycle to the city. He could have hired a cab but, since his pockets and money are on hostile Mobutu-Kabila-like terms, he couldn’t afford it. This would have the double advantage of impressing his editor that he is a dedicated reporter and would also enable him to trim his size to the Tanzania average …. He is the extreme opposite of a slim man. And that’s what caused the problem. After one kilometre, the old bicycle broke into two equal pieces. Lukurnbo suffered a king-size hip damage and was ferried … to Muhimbili by good Samaritans in a wheelbarrow which a cement dealer by the road had volunteered … to pick up a cab in the wake of the transport crisis would have cost 100,000/-. • A distant voice – like the distant drums of Jim Reeves – told Sukhdev Msabaha that it was not for nothing that he had scored an A in his fourth form mathematics exam. He calculated that he could use his father’s seven-tonne tipper to make quick money …. half a minute after parking the tipper at the bus stand … it was filled with seven tonnes of illegal passengers, each of whom paid 500/- in advance. But half way through the journey the truck developed mechanical problems. He tried to revive it but to no avail. The passengers noisily demanded a refund of their fares. But the money was too sweet to surrender, so the mathematician-journalist calculated that he could solve the problem dramatically. He engaged the special gear that facilitates the contents of a tipper to spill backwards … .in the chaos he fled the scene …. Recent visitors to Tanzania have included Prince Charles and his two sons Prince William and Prince Harry who went to the Selous and other game parks and Mrs Hillary Clinton and daughter Chelsea who visited a USAID community-based development project in Arumeru district before going on a private visit to Ngorongoro and the Serengeti National Park. Midst severe criticism from the UN Secretary General, the UN High Commissioner for Refugees and Amnesty International, Tanzania has defended its action in deporting 126 Burundi refugees who were later massacred by Burundian soldiers. Minister of Home Affairs Ali Ameir said that Tanzanian forces rounded up 157 Burundians who were engaged in factional fighting and had defied an order to turn themselves into Tanzanian police. Instead, they opted to return home after being identified as trouble makers by their fellow refugees. They were members of two radical Hutu groups fighting against the Tutsi-dominated Burundi government. The return to Rwanda of 500,000 Hutu refugees from Ngara and Karagwe was completed between December 14 and 29, 1996. The Bank of Tanzania is scrapping a proposed arrangement which would have cut its STATUTARY MINIMUM RESERVE to commercial banks by half from 12% to 6%. Every bank now has to maintain minimum reserves equivalent to 12% of the outstanding balance of its total shilling deposits and borrowings from the general public. This decision was welcomed by the IMF and has indicated the high priority Tanzania gives to its economic reform programme. The NATIONAL BANK OF COMMERCE which lost Shs 66 billion in 1995/96 and is being privatised is to be divided into three parts – a Trade Bank for large companies, a Regional Bank for medium sized companies and a Microfinance Bank for small projects – Business Times. Thirteen large companies will deal in shares on the DAR ES SALAAM STOCK EXCHANGE when it starts shortly. The companies include Tanga Cement, General Tyre, BP, AGIP, Tanzania Breweries, Tanzania Cigarette Company, and Tanzania Oxygen. During the debate prior to the passage in parliament on January 29 of the ‘Capital Markets and Securities Act 1997’ which authorises the setting up of the exchange, several MP’s complained that they did not understand the Bill, especially, as one said ‘after three decades of socialist economic policies’. “Are we now going capitalist” asked another MP – Daily News. On the same day parliament passed the ‘Tea Act 1997’ which paves the way for increased participation by the private sector as part of a process of RESTRUCTURING THE TEA INDUSTRY in Tanzania. A ‘Tanzania Tea Board’ replaces the ‘Tanzania Tea Authority’ and a special fund has been created for research and development. By joining with the Malaysian Group Petronas the South African Energy group (Engen) has gained the financial muscle to enable it to venture into DOWNSTREAM OPERATIONS IN TANZANIA. Engen has invested 100 million rands in a state-of -the-art terminal in Dar es Salaam as well as several inland depots which will ‘open up the whole hinterland’ – Business in Africa. The proposed 1997 TANZANIA INVESTMENT ACT, expected to be enacted shortly will spell out the incentives to be given to new investors, the qualifications needed, the areas of priority for investment (which will include mining, agriculture, manufacturing, tourism, banking, media and aviation), tax concessions and a new simpler way in which expatriates can obtain work permits for approved projects. The Zanzibar State Trading Corporation bought 12,000 tons of CLOVES worth Shs 36 billion this season, about 75% of the projected target – Business Times. Tanzania has introduced the SINGLE BILL OF ENTRY SYSTEM for all customs declarations including imports, exports, warehousing and transit goods, thus reducing the length of time for clearing goods at the port from one or two weeks to 24 hours. New CURRENCY NOTES of 10,000/-, 5,000/-, 1,000/-, and 500/- which bear the head of a giraffe rather than that of the President were issued on March 10. Existing notes remain legal tender – Daily News. In spite of strong opposition from the Board of Air Tanzania Corporation it looks as though there might be eventually a MERGER between the national airlines of Tanzania and Uganda (Rwanda wishes to join too) with ‘Alliance Air’ ‘to save’ according to Tanzanian Minister William Kusila ‘both airlines from eventual collapse’ – East African. VALUE ADDED TAX is scheduled to be introduced on the mainland on January 1 1998. It is expected to replace sales tax on locally produced goods and services, hotel levy and stamp duty on receipts. Shs 3.6 billion from World Bank and EC projects is being spent on preparations for it – Business Times. The Swiss Societe Generale de Surveillance has built a $500,000 MINERAL TESTING FACILITY in Mwanza to cater for gold prospectors in the Lake Victoria zone – East African. The long awaited harmonisation of CUSTOMS TARIFFS between the mainland and Zanzibar finally took place on January 24 for rice, cooking oil, wheat flour, sugar, khangas and kitenge cloth. It is hoped that this will reduce the losses of revenue through the ‘Zanzibar route’ which have amounted to between Shs 500,00 and one billion per month – Daily News. TANZANIA AND RUSSIA are in negotiations about the settlement of the $600 million said to be owed by Tanzania. 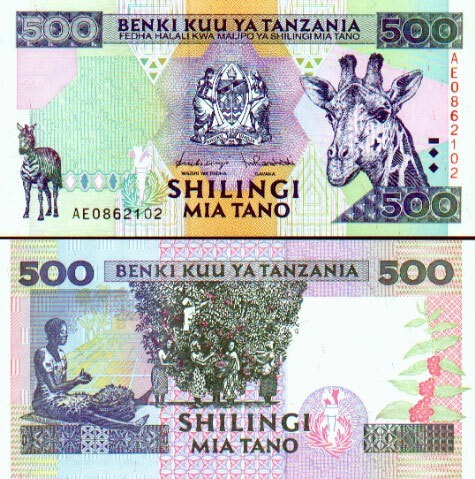 One of the issues being discussed is the unstable exchange rates of the Tanzania shilling and the Russian rouble since the mid-1980’s.